Property renovations for the 2019 Rental Season include a brand new Master Suite, new built-in bunk beds in the Loft area, fully renovated Kitchen and Great Room, and gorgeous hardwood flooring throughout the 1st floor including both Master bedrooms! Located just 4th row from the sandy Atlantic Ocean beach and directly on the paved beach path, 5 Cedar Waxwing is a beautiful vacation home with 5 bedrooms, 5.5 baths, loft with bunk beds and bedding for up to 20 guests. High end appointments, from hardwood floors to custom cabinets, real wood Plantation Shutters and ceiling fans throughout are balanced with plush furniture, multiple living areas and an open floorplan. This home is less than a 3-minute walk to the beach and offers exceptional amenities, such as private pool (can be heated for additional charge), spa, furnished deck overlooking pool and gas grill. The 1st floor of this home features a formal living room with vaulted ceilings and wall-to-ceiling windows, formal dining room, family room with flat screen TV and built-ins, kitchen with double ovens, breakfast bar and 5 bar stools and breakfast table with seating for seven. A half bath and access to the 2-car garage complete the first floor. The master suite has a dedicated staircase with 6 stairs from the 1st floor and features a king bed, sleeper sofa and flat screen TV. The large master bath has a double vanity, walk-in closet, private washer and dryer, separate tub and shower and abundant natural light thanks to a skylight and beautiful window over the tub. A separate staircase leads to the second floor with loft area, 4 bedrooms and full laundry room with washer, dryer, storage cabinets and sink. The loft is perfect for games or entertainment with flat screen TV, desk, and comfortable chairs and couch and also doubles as a sleeping area with a set of built-in bunk beds. The newly added Master Suite (2019) is located directly beside the loft at the top of the staircase and features a king bed, full bath, walk-in closet and flat screen TV. The second bedroom on the 2nd floor features a king bed, flat screen TV, walk-in closet and full bath with walk-in shower. This bathroom also has an entrance from inside the bedroom as well as a hall entrance to serve as the bath for the loft area. The third guest bedroom features 2 queen beds, flat screen TV and full bath with shower/tub combination. The fourth guest bedroom has a dedicated staircase from the loft area and features a set of bunk beds and two twin beds with trundles. This bedroom has a flat screen TV, large closet areas and a full bath with walk-in shower. 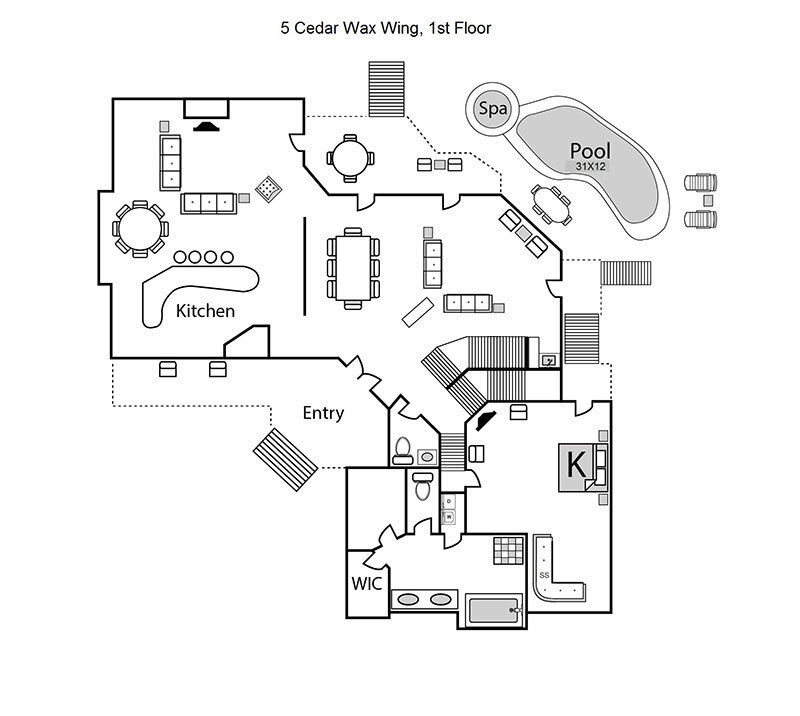 Amenities at 5 Cedar Waxwing include a private pool, spa, gas grill and furnished patio area. The setting is perfect for entertaining, dining, reading or relaxing. Spa heat is included with your rental and the pool can be heated for an additional fee. Wireless internet is available at no cost to guests and garage use is allowed for all guests of this home. The location of 5 Cedar Waxwing in Sea Pines is unbeatable. The beach is only steps away thanks to the paved beach path right beside the home, and the South Beach Marina is an easy walk or bike ride from your front door. Harbour Town, the Plantation Golf Club, the Sea Pines Beach Club and Lawton Stables are easy bike rides or short drives away. Sea Pines is a world-class vacation resort with pristine beaches, miles of biking trails, Lawton Stables with live petting zoo, public golf courses, including Harbour Town Golf Links, Racquet Clubs, shopping, restaurants and fully operational marinas in Harbour Town and South Beach with water sports, fishing charters and live entertainment. Most Sea Pines amenities are open to the public, but some may have parking fees or seasonal rates as determined by the resort. We spent the week with another family and absolutely loved this house! Very close to the beach with a direct path a few feet from the house. Very close to Harbor Town and other popular areas on the island. I would recommend this to anyone.